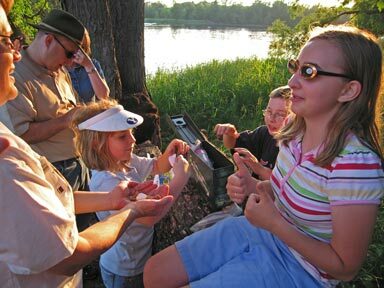 June 30, 2008: Paula is on the left with the Paul and Teresa Hirst family at Crow Wing State Park, about nine miles south of Brainerd, MN. 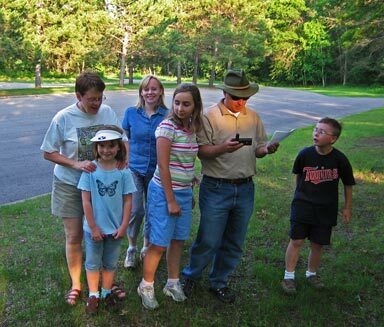 The crew is out Geocaching this evening. 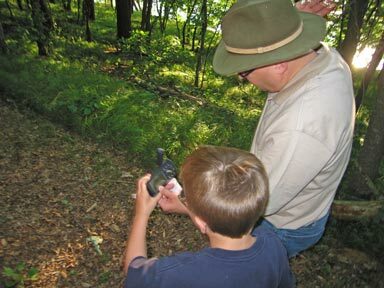 They are using a GPS (Global Positioning System) receiver to determine their location and to seek a hidden cache. On the trail, but not there yet. 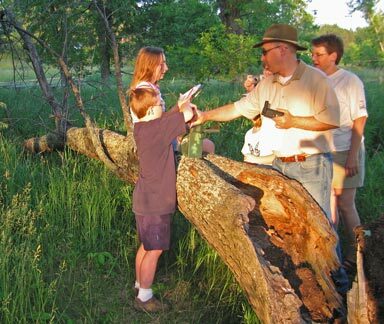 Success...they find the treasure in a surplus ammunition container hidden in a fallen tree. There are trinkets and other items to be traded. Paul is writing a log of the visit, which will go back in the Geocache container. In the background is the Mississippi River, which flows through the park.